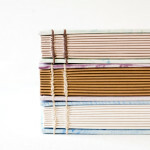 Come learn how to make a handbound Coptic-style book! Dating back to the 2nd century A.D., Coptic bindings are a flexible and exciting book structure with a lot of creative potential. Complete with hardcovers on the front and back, and exposed sewing on the spine, coptic binding is a structural and decorative format to work with. Coptic books are ideal notebooks or sketchbooks, because they are able to open completely flat to any page. Participants will learn to prepare cover boards and signatures (groups of pages), then sew everything together into a sturdy and useful book.